When Julian Abele completed his design for the Parkway Central Library in 1926, he likely could not have imagined how different libraries would look in the 21st century. The expansive hallways Abele created for card catalogs are now gallery spaces where library users can learn about essential American authors or view contemporary works of art. In the Culinary Literacy Center on the fourth floor, Philadelphians of all ages cook up new ways of learning in a space that was originally used for sorting books. And on April 12, the area that once housed the Parkway Central book stacks will open to the public for the first time as three new spaces devoted to teens, business resources, and civic engagement. 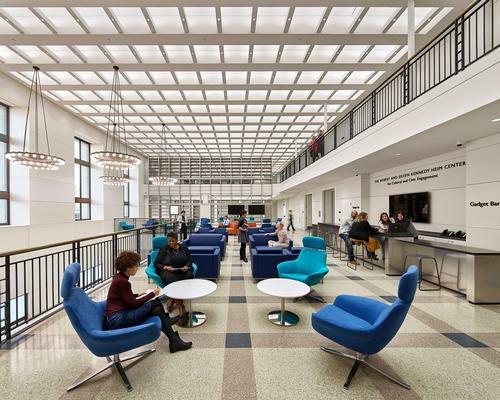 At the core of the reimagined Parkway Central Library is The Robert and Eileen Kennedy Heim Center for Cultural and Civic Engagement, a public space unlike any other in Philadelphia. The Heim Center is a welcoming, bright, flexible, and architecturally distinctive forum for lively engagement and interaction, artistic expression, civic discourse, and grassroots problem solving. Here, Philadelphians can meet in a spirit of exploration and know they are in a place where everyone’s ideas matter. The main open space, accessible from Parkway Central’s lobby, will serve as a "noisy commons" at the heart of the library. Comfortable furniture, WiFi access, and LED screens make this an ideal landing spot for library users engaged in collaborative work, tackling a research or creative project, or just looking for a place to have a conversation. Larger groups can use a new seminar room for workshops or meetings, while individuals or small groups can reserve four study rooms on a walk-up basis. One of the study rooms is also acoustically treated, so after you check out an instrument from the Music Department, you can start practicing right away. Library visitors can expect a hub of civic and cultural activity in The Heim Center, with some programs organized by library staff and many others produced by community members and partner organizations. On opening day, you can attend a workshop on how the Pennsylvania court system works, led by Pennsylvanians for Modern Courts. A couple days later, stop in for the Philly Loves Romance reading group, or a musical performance of songs and poetry organized by the Free Library’s Literature Department. In June, Dr. Judith Giesberg will lead a discussion about the history of Juneteenth, while the Philadelphia Offices of Immigrant Affairs and LGBT Affairs will co-sponsor a community conversation marking Immigrant Heritage Month and LGBTQ+ Pride Month. And over the next year, artist Caroline Woolard, the inaugural Walentas Endowed Fellow at Moore College of Art & Design, will produce a series of sculptures and public events focused on collaboration and conflict resolution. Libraries have always been places to encounter information, knowledge, and ideas. In 1927, when Parkway Central Library opened, access to information involved a complicated system of teletype book requests, conveyor belts, and dumbwaiters that brought books down from the stacks into a customer’s hands. As the ways in which we communicate information changes, so, too, do our library spaces. In 2019, information may travel with us in our pockets and backpacks, but we also find knowledge through human interaction. Public spaces like the library are where we hear about the lived experiences of our neighbors through story slams, encounter new perspectives through art and music, think together about how to solve big challenges, question our own assumptions, and develop relationships with people we aren’t likely to meet anywhere else. The Heim Center was purpose-built for just these kinds of interactions: the free exchange of ideas and experiences that strengthens our city. We hope you’ll find your way here—and bring your ideas with you. Visit the brand new The Robert and Eileen Kennedy Heim Center for Cultural and Civic Engagement at the public grand opening on April 12!